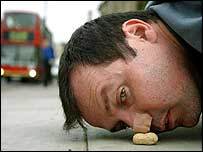 An artist who previously pushed a monkey nut along the road with his nose for seven miles has pulled a bus 30m with his toe. Mark McGowan, 38, dragged the 7.5 tonne vehicle on Wednesday in Camberwell, south London. The stunt was in protest against bus lanes and mayor Ken Livingstone's "ridiculous traffic strategy". The Big Toe Bus Pull began at 1000 BST and Mr McGowan made several attempts before completing the task. In September last year the fine art graduate rolled a monkey nut with his nose from Goldsmiths College in New Cross, south London, to the door of Number 10 Downing Street to protest against student debt. It took him 12 days to complete his challenge, with him covering about three-quarters of a mile every day. He has also sat in a bath tub full of baked beans, with two chips up his nose and sausages wrapped around his head for 12 days to celebrate English culture and food. Speaking about the bus stunt, Mr McGowan from Peckham, south London, said: "This project was a protest against the excessive use of bus lanes and against mayor Ken Livingstone's ridiculous traffic strategy. "It is stupid that our all ready narrow roads are being carved up, causing endless road nightmares for car drivers." The bus had a driver for health and safety reasons.